The Twin in Berlin: The Accent Sounds Like Someone Speaking German With An Irish Accent. The Accent Sounds Like Someone Speaking German With An Irish Accent. 28th this past week I reached my 9 month mark aka my halfway mark!! set to come home. What a life, what a life. return. Sometimes, that is hard to recognize, especially when people are mean or lame. BUT it's true. I am realizing that more. I have realized how Christ feels as well. People persecuted him, mocked him, and ultimately killed him. But he completed his mission, because he knew how important it was. I am grateful that I am starting to realize that. I have come to know the Savior more on my mission. Leipzig is AWESOME. It is an old city, but also really modern. Pretty much the place to be. There is this really awesome university that looks soooo coooool. And an Opera House. And this really cool Rathaus, well city hall. Google it! The new one is so cool. It's huge here, I love it! The accent sounds like someone speaking German with an Irish accent. I find it amusing. Still a bit hard to understand, but I love it. I see Elder Clarke almost every day, it feels like. He is a solid missionary. I never would have thought that we could serve together! He is a stud. SO MANY TIMES I have almost called him by his first name. haha, that's a bit of an awkward and fun adjustment. With the ipads, they told us that the church owns the ones here in our mission, so we don’t keep them at the end. But mal sehen, that may change in the next few months. Lou Song, wanted to move her baptismal date a week later, as she has a huge test the week before. We were talking about the Holy Ghost, and she said she wants it so she can feel positive in her life from his influence! SO SWEET. She wants to keep the commandments. Man, I love her!! We met this cool guy a few days ago, Marcus. We talked about the Book of Mormon with him, and although he is not too religious, he wants to meet this week. We met with this cute tiny Vietnamese less active in the ward. She is TINY. And when she puts on her glasses, her little eyes get all huge. It was a solid lesson about gaining a testimony of the Book of Mormon. 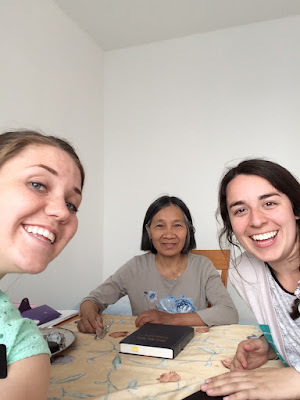 She reads aloud from her BOM in Vietnamese, and we read in German. I love her already!! Yes mom, if you send me a letter or email, I can read it, and then respond on Monday. If you send me a video, I just have to get permission. But I’m down!! The best thing that happend this week was talking to people on the street, to be honest. So many times this week I have just had those "I am a missionary in German!" moments. I love that I can just walk up to people and talk with them. Although we get rejected pretty fast sometimes, it is a wild experience. And this country and the people are just beautiful. Man. it is so cool. Challenging thing this week was getting up!! I have been pretty tired this week, not going to lie. But it's a good feeling. In the work of the Lord it's all worth it. Just like President Eyring said in some talk that I don't know, he lets out this rallying cry, "Remember Him!" We are standing side by side with Christ in His work. He makes me strong, He gives me the love and the desire to keep going, even when I want to rest. How grateful I am for His leadership in His vineyard.